• I have even less time and opportunities to write blog notes than during the last months, or follow the Korean events. • reading the printed version of Chosun Ilbo, I'm not surprised that some think Chosun bears some responsibility for the skyrocketing real estate prices, as so many of the whole-page ads were about real-estate. But ascribing so many of the present-day social ills to Chosun Ilbo, the critics are admitting that the anti-Chosun activity has been unsuccesful, as far as its aim has been to "normalize" the influence of the paper and achieve a state of affairs that Chosun no more decides the issues of the day. • I did not remember that Korean TV is this bad. It shows that it's been long since I've been to Korea. 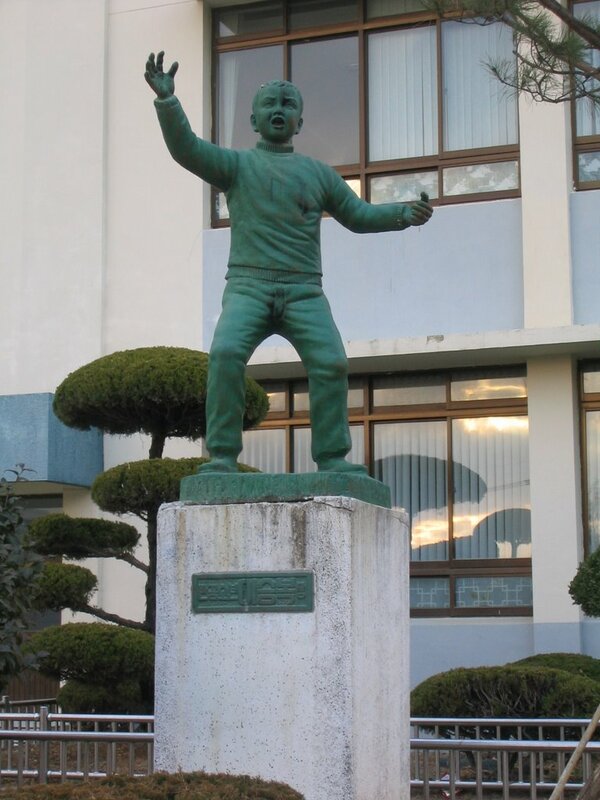 • I didn't mean to talk about Chosun Ilbo all the time, but the accompanying photograph that I took yestertoday in front of a comprehensive school (ch'odeunghakkyo) in Changwon today inspires me to do so. 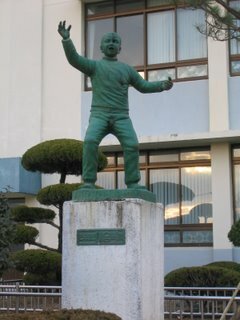 It's a statue of the "anti-communist child Yi Seung-bok", who was killed by North Korean commandos in 1968 with the most of his family. Chosun Ilbo reported at the time that he had told the commandos "I hate the Communist party" (kongsandang sirheoyo), for which he had been killed and his mouth slashed open. It's not only Chosun's reporting back then and later that has contributed to the use of Yi in anti-communist campaigning, but Chosun's story of Yi's alleged words ("I hate the Communist party") has since the late 1990s gathered the ire of anti-Chosun campaigners as an example of distorted and false anti-communist propaganda, with claims that there's no proof that Yi would have said so and that Chosun's reported wouldn't even have been present after the killings in the location. Chosun has taken the case to court, and the High Court decised last month that Chosun had been correct (see Chosun, Nov 25, 2006; see also Chosun's special section of the Yi Sung-bok case). Chosun was of course triumphant after the decision, and its opponents expressed disappointment and bewilderment because their view is that known facts are against Chosun. • It'll be quite interesting to see people that I've written a Ph.D. thesis about after four years. By Subway The simplest way to get to AKS from Seoul is to take the subway. There are two main routes. Take the #4 blue subway line heading south. Get off the train at Indeogwon Station (seven stops south of where the blue and green lines meet at Sadang in southern Seoul). Leave the station via exit #2 and walk 25m straight ahead to the bus stop. Take the #303 or #1550-3 bus heading towards Bundang (W1,500) and get off in front of AKS (about 15 mins). Or, you could take a taxi (about W10,000). Take the #3 Orange subway line and change to the Bundang line at Suseo Station. Get off at Seo-hyeon Station or Sunae Station and geta taxi to AKS (about W20,000). What follows is the abstract of my presentation, but I'm afraid it fails to convey the absolute richness and brilliance of my paper. Yes. This presentation discusses the position and role of family or household members in Korean small businesses, focusing on the nexus of a married couple so often found behind the operation of small retail or service establishments, but also delineating and analyzing the participation of other household members. The persons who appear in this presentation and who provided its primary ethnographic data were men and women working together with their spouses in small “neighborhood” businesses with varying degrees of technical or commercial expertise and skill, intensity of labor, formal and actual responsibility and time invested, adapting to and utilizing shared cultural assumptions and understandings concerning the roles and spheres of men, women, and offspring of households. First I outline some general contours of keepers of small businesses in comparative material, paying attention to the prominence of married couples in the organization of labor in the operation of establishments. I also note that despite of the commonly used definition of “family business,” comparative material on small businesskeepers suggests that those establishments tend not to be inherited within the family and that the stratum is mostly transitional and reproduced through new entrants. My research and other sources suggest that it is even more pronounced among Korean keepers of small businesses, especially in the cultural milieu favoring salaried and professional employment based on educational credentials. Drawing on my fieldwork, I remark that contributions by family members, while occasionally important in some cases, are by no means very common, and the participation of family members in operating the shops is characterized by its notable absence as much as by its occasional presence. As businesskeeping is not part of the long-time aspirations of the household, its members’ participation is not unconditional and they tend not to be subordinate to the demands of businesskeeping. While the contributions of household members are of occasional and conditional nature, the appropriation of spousal labor is more given and unconditional. Whereas some characteristics of the common gender divisions of labor in small businesses can be seen as extensions of household divisions of labor, in such a work setting a shopkeeper man is not as wholly removed from the domestic sphere as a salaried man is, and women are removed out of the household in a way that they often find uncomfortable and unsatisfying not only due to cultural notions of male and female spheres but also because of awareness that such a condition is likely to be detrimental for the family aspirations and trajectories.